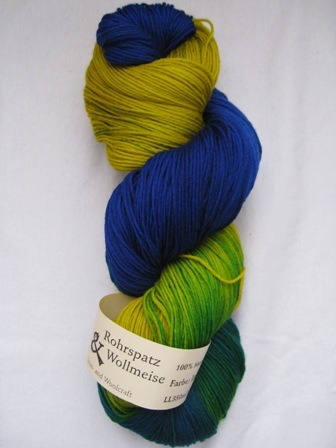 After hearing my tale of woe (at about 5:30am…we get up very early to walk our boys) about missing out on Wollmeise during the last sale over at The Loopy Ewe, my darling husband stepped in to enable me once again. Thank you sweetness!! I really can’t convey to you how supportive this man is of me and my “habit”. 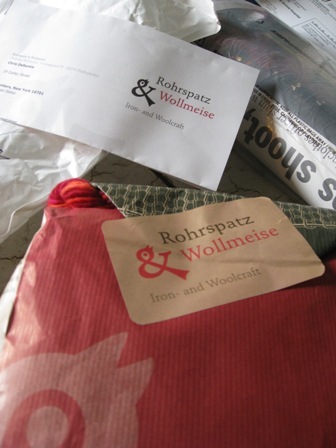 This is what arrived last Saturday from Germany. Both are laceweight and beyond gorgeous!!! And this gem came from this amazingly generous lady…Lynne, out of the kindness of her heart, sold me a skein of the sock yarn. Thank you, Thank you, Thank you!!! I know what you’re thinking…not my usual colors but could you resist…that much color just pulls you right in. I checked on Ravery and a few people have made socks out of the laceweight (that’s a truck load of socks). We’ll see. Right now I’m just going to roll around in my yarn. Maybe I’ll finally be motivated to dunk my toes into the lace pond. I haven’t ventured there yet…A little afraid? Maybe…but all that color may be just the motivation I need. This is only a little better than a dollar for a tooth…hee, hee. on February 3, 2008 at 3:41 am | Reply Kim D.
What a wonderfully kind husband. 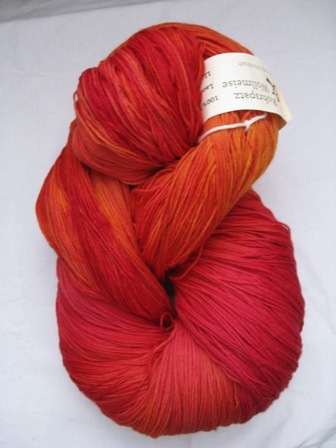 Although, I have to admit that once I read your email I decided to hop over to Loopy Ewe and place an order for some other sock yarn I had had my eye on. 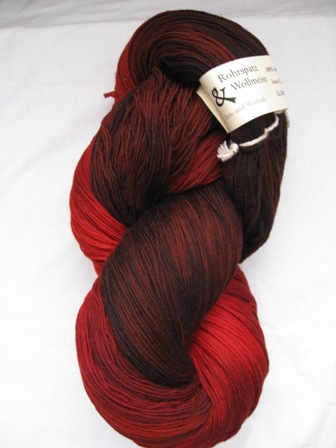 Of course, it wasn’t the Wollmeise, but it was some nice Dream in Color and some Chewy Spaghetti sock yarns. Enabler! you are most welcome, sweet thang. i don’t know what i’m going to do with mine, either, but the color makes me happy anyway. That Campari Orange is right up my alley. I can’t wait to see it on your feet! Oh that first yarn, the delicious reds. Oh my!